at farewell event for Prof. Peter Gomez at Hochschule St. Gallen on October 30. - from key speakers and supporters. Please visit and comment - we will reference and tweet important comments! Rick Wartzman, Executive Director The Drucker Institute - Is there really a movement building to counter "Maximizing Shareholder Value"
- please see an excerpt of the participants list with company, function and country. 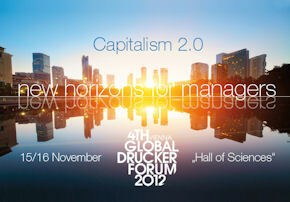 Bookshop MANZ will present a selection of publications regarding the GPDF at the forum site. You may order or reserve the speaker's and chairs' publications under Speakers 2012. Find all relevant titles of and about Peter Drucker under Primary and Secondary Literature.